"A yummy mixture of lime gelatin and fruit, perfect for every occasion." Dissolve lime gelatin in boiling water in a bowl; stir cold water into gelatin. Pour gelatin into a mold. 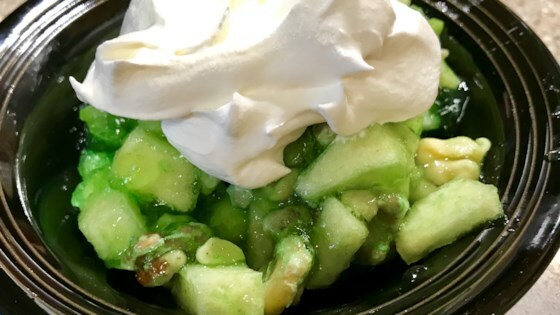 Stir apples, celery, and walnuts into gelatin. Refrigerate until firm, about 4 hours. Dip mold into hot water to loosen salad; place a plate on top of the mold and invert to release salad from mold. This is a great salad as is, however, I cut back on the apples and added shredded carrots. I made it even more colorful. Doubled it makes a great pot-luck dish. This is my Dad's favorite salad... making it for him for Father's Day. Very tasty and refreshing jello salad. I made it as per the recipe and poured it into a 9 x 11 Pyrex dish to chill. I served it with a dollop of Cool Whip.